We’re having a hard time classifying this one, other than putting it into the “wow, that is interesting” category. Ricardo Cabello, aka Mr. Doob, put together a browser-based app over the weekend as an experiment using node.js and websockets and came up with a real-time, multi-user sketchpad that enables, well, multiple users to draw on a white background with just their mouse. 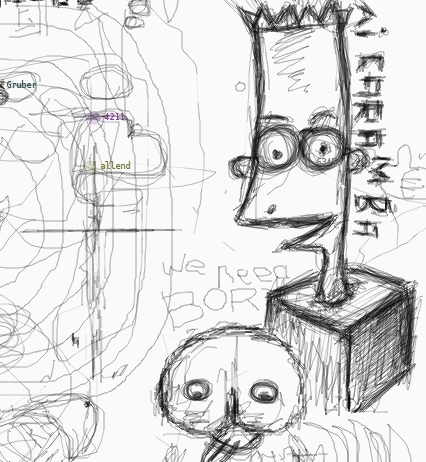 The app only works in Safari 4+, Chrome 5+ and Firefox 4+ and lets users draw anything they want, either by themselves or in collaboration with others, with the end result sometimes looking like the back of a toilet stall door (so much so at first that Cabello had to make tweaks in the code so that people would draw less phallic symbols) and sometimes it can produce much more artistic renderings. Below are some of the screenshots that Cabello has taken (more on his Twitpic account), as well as the one we took just now after leaving it open for about 10 minutes (there were about a dozen people on our screen when we started). Don’t like what you’re seeing? Just hit refresh and the screen is washed clean and you (and others) can start right up again. Very interesting project that gives a glimpse at what Web apps can do in modern browsers with modern code. Read next: Will OLED Shortage Doom Android Growth?